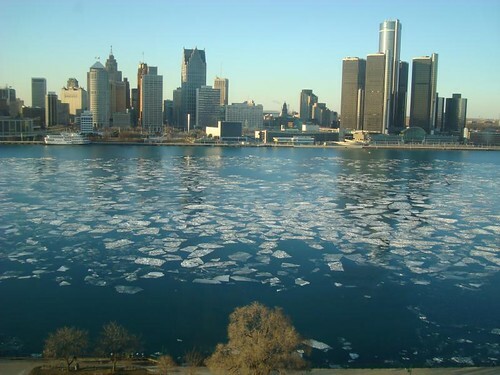 The Detroit skyline, as seen from the Windsor Club in downtown Windsor. A cross border effort to shed light on homelessness issues will run all night tonight, broadcast live on CJAM 99.1 FM. While scrolling through Facebook this morning, I came across a status that read something along the lines of, “All these Haiti fundraisers are great, but let’s not forget about those who are suffering right here in our own city.” It seemed almost serendipitous that I stumbled across a news piece from Chicago about an annual event spotlighting homelessness that’s taking place in the Windy City, Detroit and here in Windsor. The Homelessness Marathon is a radio broadcast that will begin tonight at 7pm, and will continue until 9am tomorrow. The marathon is in it’s 13th year, and will originate from a building in the Cass Community Social Services Complex, at 12025 Woodrow Wilson Street in Detroit. Homeless Detroiters will be on location to speak to the community, and the nation. The live broadcast will also feature a live remote from Bloomington, Indiana, and a discussion with homeless people in Los Angeles. There will also be stories told about Safe Haven, a tent city in Champaign-Urbana, Illinois, and updates on the rebuild effort after Hurricane Katrina in Mississippi. Of interest to Windsorites is the cross-border discussion that’s set to take place. A toll free phone line will be open all night to take calls from people across the continent, homeless or not. The goal is to get people sharing ideas and “comparing notes”, on how to get help with medical problems, finding suitable shelter, etc. An open forum spotlighting the unique issues that face the homeless will hopefully spark up meaningful discussion, possibly leading to some feasible solutions. CJAM (99.1FM) will be airing the Homelessness Marathon in its entirety. The toll-free number to call if you have any questions is 877-NOBODY-8. For those who are homeless (now, previously, or in fear of becoming) may also call 877-LEFT-OUT to voice their concerns. The general call-in number for this broadcast will be 877-NOBODY-8. People who are homeless, formerly homeless or afraid they’re about to be homeless may also call 877-LEFT-OUT.